Florida Panthers general manager Dale Tallon has repeatedly stated that he will be aggressive this off-season and the team has been linked to Columbus Blue Jackets pending free agents Artemi Panarin and Sergei Bobrovsky throughout the year. 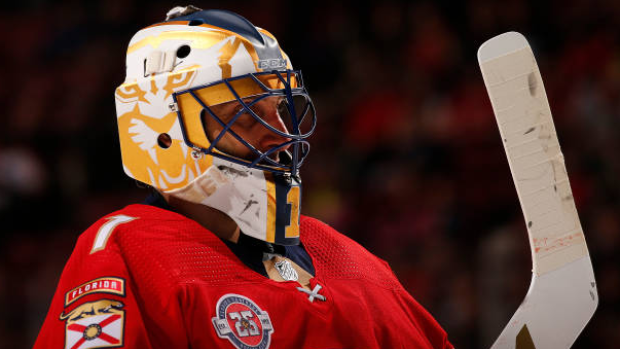 It's unclear, however, what signing Bobrovsky would mean for 39-year-old Roberto Luongo's future with the franchise. “It’s a bit of a tough situation,” Luongo told TSN Hockey Insider Pierre LeBrun for The Athletic on Monday. “I still love to play the game. We’ll see where it goes, I haven’t really made a decision one way or another. It’s going to be important once the season is over to talk to Dale and management and coaches and see what the plans for the future are. And hopefully they involve me somewhere. I understand I’m not 30 years old anymore and I can’t take on a 50-, 60-game workload. Luongo, who allowed five goals on 33 shots in relief of Samuel Montembeault on Monday, has a 15-16-4 record this year with a 3.19 goals-against average and a .897 save percentage. The veteran of 1,010 career starts will turn 40 next week and carries a $4.53 million cap hit through the 2021-22 season. Should Luongo choose to hang up his skates this off-season, the Panthers will be left with a $1.29 million cap recapture penalty for the next three seasons, while the Vancouver Canucks, who signed Luongo to his current contract, would face a $2.84 million cap penalty for the next three years. The Panthers, who made a total of seven trades in the month leading up to the trade deadline, are currently scheduled to have $17.5 million in cap space this off-season (if the cap stays flat at $79.5 million). In addition to Luongo, the Panthers have goaltender James Reimer signed through 2020-21 at a $3.4 million cap hit. Montembeault, who's appeared in nine games this season, will be a restricted free agent this summer. Luongo said Monday he believes the franchise is heading in the right direction to become a contender. The Panthers, who could be eliminated from playoff contention as soon as Tuesday night, have reached the postseason just once in the past seven seasons.